To see more photos from the ride-along, CLICK HERE. Members of the U.S. Coast Guard’s Lake Charles office spent the weekend looking for impaired boaters. The Coast Guard joined state Wildlife and Fisheries agents for Operation Dry Water, a national effort to reduce the number of alcohol and drug-related accidents and fatalities on the water. State law says a person is impaired if their bloodalcohol content exceeds 0.08 percent. As well as looking for impaired boaters, officers also checked all required documents and safety equipment such as registration, fire extinguishers and life jackets. In 2009, there were 32 boating accident fatalities in Louisiana. Of those, seven were alcohol-related and 29 of the victims were not wearing a life jacket. Common violations seen over the weekend included children not wearing life jackets and illegally moored boats. During a Saturday afternoon ride-along, officers came across a family with the proper number of life jackets, but none of the teenage children were wearing them. Louisiana law states that children age 16 and younger are required to wear a life vest if on an open motor boat or on the deck of a cabin cruiser. A boat with a group of young adults was tied off to the fender system under the Interstate 210 bridge, which is illegal. Boaters are required to have their vessels’ proof of registration on board at all times, and the driver and all adults should have some type of identification. Officers make sure the registration number on the forms match the numbers on the boat and that the fire extinguishers have been tested or are up-to date. Boats more than 16 feet long are required to have a fire extinguisher and a kill switch for the engine. A person boating under the influence faces the same penalties as those of an impaired driver on the road. These include jail time, fines and the loss of boating and driving privileges. 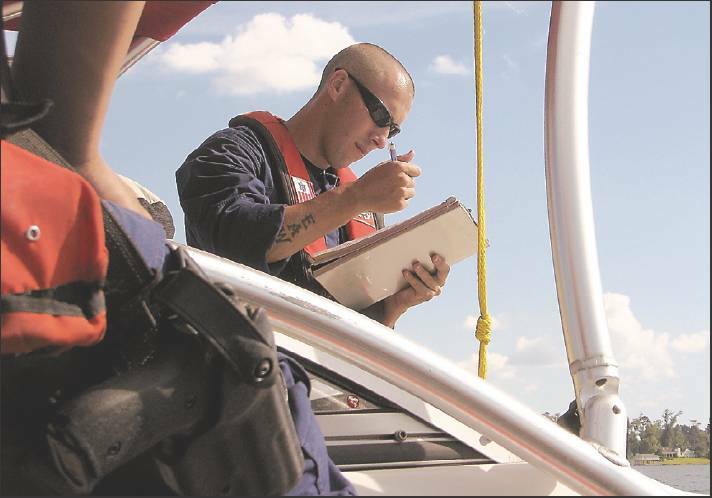 Along with law enforcement, the main task of the Coast Guard’s Lake Charles office is ports and waterways security. This includes escorting LNG tankers and providing security around plants. Recreational boaters should try to stay about 150 feet away from Coast Guard escorts, which are announced on citizens band Channel 16 for the public. Entry filed under: article, multimedia, photos, public safety. Tags: boating safety, boating under the influence, lake charles, life jackets, operation dry water, US Coast Guard.